One of the characteristics of a myth is its tenacity. The Greek myths have obviously endured for millennia and still infuse our culture. Stars Wars is a franchise which has also attained mythic status and the same can be said for Star Trek which has had iterations both as a classic television series and series of films. But how do characters age in myth? Harrison Ford returned as Han Solo in Star Wars:The Force Awakens, but by the end of the movie he’d been consigned to cosmic as well a cinematic oblivion. 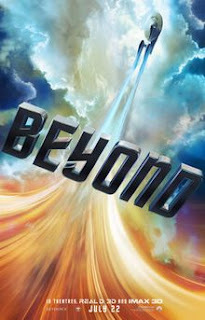 In the recently released Star Trek Beyond, Kirk (Chris Pine), Scotty of “beam me up Scotty fame” (Simon Pegg), Chekov (Anton Yelchin, who in reality was killed in a freak accident before the film was released) and Spock (Zachary Quinto) are all back as well as the iconic starship Enterprise. But with Leonard Nimoy gone Spock, for all intents and purposes, inhabits another universe and at the end of the film he flips a page from the family album where the original Kirk (William Shattner) appears. Without igniting a spoiler alert an interesting element of the plot in this new edition of Star Trek lies in the fact that the villains are not really aliens. And though the vision of their leader Krall (Idris Elba) aka Balthazar Edison is one of eternal strife and struggle (Kelly Clarkson's “what doesn’t kill you makes you stronger”), he possesses a hive mind—which turns out to be his undoing. Like Rey (Daisy Ridley) in the Star Wars sequel, Star Trek also contains a heroine Jaylah (Sofia Boutella) who is a refugee from tyranny. But what's most interesting are the new phenotypes which cross the screen. As with Zeus, Atlas, Hera or any of the classic heroes of yore, our current race of superheroes, in this case Krall/Edison and Spock (who contemplates retirement in this latest version) have undergone their own evolution, interacting and finally reflecting the worlds of out of which they’ve been created, in order to reinterpret the original myths which gave birth to them in the first place.